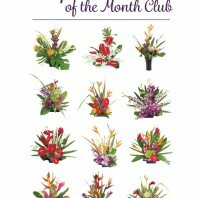 Categories: Hawaiian Tropical Flower Assortments, Specials. 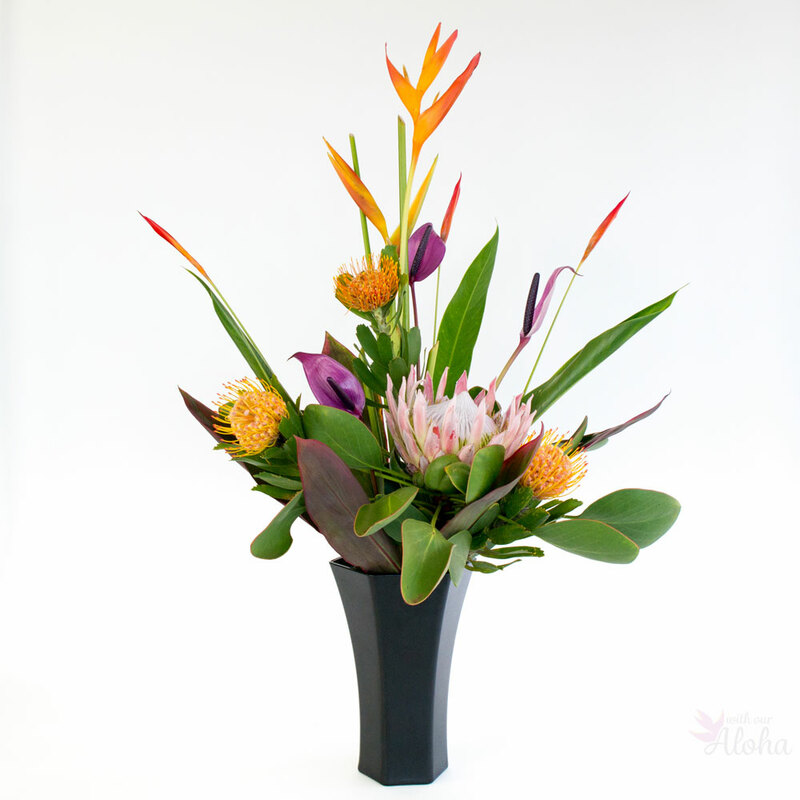 Sensational any time of year these Hawaiian flowers features a large Maui king protea, delicate pincushion protea, tall heliconia and anthurium. Dark and light green foliage complete your assortment for a stunning gift or decorative display any time of year. 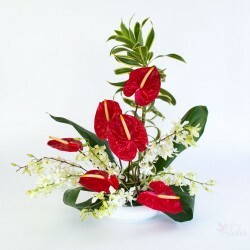 Arranging these tropical bloomers in any type of vase and they will be impressive. 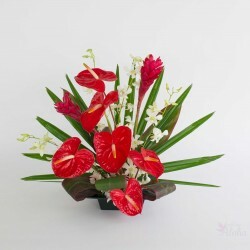 This is a unique collection of flower sizes, colors, shapes and textures. This is a wonder mix of flower sizes and textures. 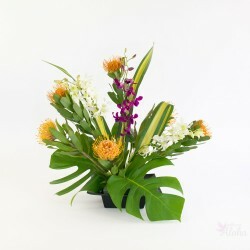 The large compact king protea will center your arrangement. 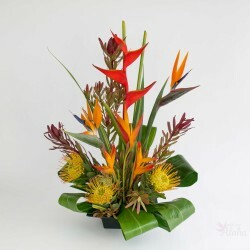 Surround it with tall, wide anthuriums and the sleek heliconia. 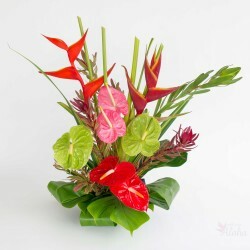 We add Hawaiian ti leaves to fill in with lovely green. While this is primarily a springtime assortment it is generally available all year. The king and pincushion protea begin to bloom in fall. They can be a bit difficult to find in the summer months when we will substitute a comparable bloom to balance your flower mix. 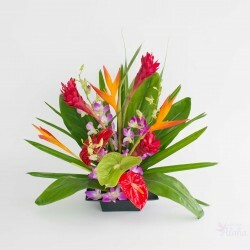 These Hawaiian flowers come to you carefully boxed and packed with their full stems. You can arrange them any way you like. 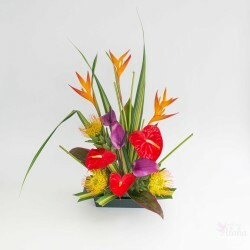 We have a suggested arrangement below and on our blog. King protea are seasonal. In summer months some kings are not full enough to suit us so we may substitute exotic gingers to balance your assortment. 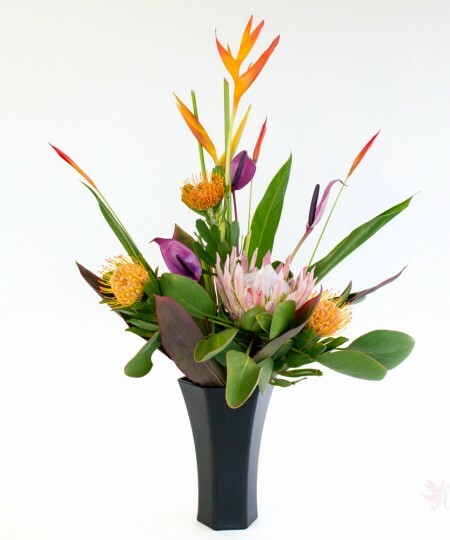 We send full length stems; not already arranged. 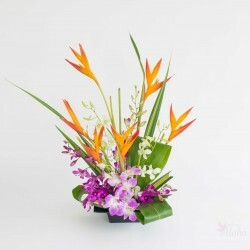 Available in 6, 12 or 24 stems plus greenery.